9 in 1 Body Building Push Up Rack Board System Fitness Comprehensive Exercise Workout Training Gym Exercise Pushup Stands. Heavy duty "Plug & Press" push up board system with multiple positions and angles that sculpt and maximize upper body definition. Product features: exercise abdominal muscles, exercise arm strength and wrist, exercise waist and so on. To improve the body function. To speed up blood circulation, increase lung capacity, and promote athletic ability. Improves strength in upper body, arms, legs & stomach. Perfect for indoor and outdoor use. Made of pp, pvc and rubber material, sturdy, comfort and slip-resistant. Working out has never been simpler, for beginners or fitness veterans. And it's cool looking, so that's a definite plus. Maximum Fitness Gear. 1, Easy to assemble, easy to disassemble. Install the handle and use. Push up bars are made of good-quality engineering plastics, which is hard enough to support any weights. The material of main construction engineering plastics is very sturdy and durable. Slip-resistant foam is used as push up handles is so soft that users can hold comfortably. Heavy duty "Plug & Press" push up board system with multiple positions and angles that sculpt and maximize upper body definition. Use: Exercise the back muscles and abdominal muscles. Included: 1Set X Push Up Rack Board. • Handstand, O.A.H, Hollow Back. • Tuck, Starddle Pike, Full Press Handstand. TRIED & TESTED BY CALISTHENICS, FITNESS & GYMNASTICS ATHLETES & HAND BALANCE ENTHUSIASTS AROUND THE WORLD. • Straddle & Full Planche. Heavy duty Plug Press push up board system with multiple positions and angles that sculpt and maximize upper body definition. 1 x Push Up Board. If item is defective after 3 months, you can still send it back to us. Contenu : 1 paire de poignées pompes. Convient pour salle de gym ou l’excise à la maison. Contenu : 1 paire de poignées pompe. Included: 1Set X Push Up Rack Board. Heavy duty "Plug & Press" push up board system with multiple positions and angles that sculpt and maximize upper body definition. Due to the different monitor and light effect, the actual color of the item might be slightly different from the color showed on the pictures. Form: Rotating Push-up Rack. Foam Roller. Sporting goods & Fitness. They may need your phone number to call you to pick it up. Otherwise deal is final. Color: Green,Blue. Model Number: AliWPFWC001. We will be happy to resolve any issues you may have in a cordial and friendly manner. Yep, us too! Plug and Press in multiple pushup positions and angles like no other pushup product. BONUS: Tone and Burn Workout DVD ~ 10 Week Program that sculpts and tones your upper body and lower body. Fitness Technology. Rotating handles help reduce joint stain. The 21-plan allows you to customize your workout to fit your level but also pushes you to increase your 1 set max. Perfect for all fitness levels. Push Up bares soporte tire prensa barra espuma mango Inicio ejercicio Pushup pecho 4 brazos. Mangos de espuma acolchada proporcionan un agarre suave y cómodo, las barras acolchadas que mantiene barras en su lugar en la mayoría de las superficies (superficie dura, alfombra, piso laminado). Push Up Bars Stand Pull presse barre mousse poignée accueil exercice Pushup poitrine 4 bras. Convient pour salle de sport professionnel et de la formation accueil. Fabriqués à partir de tube en acier avec rembourrage en. Heavy duty "Plug & Press" push up board system with multiple positions and angles that sculpt and maximize upper body definition. Use: Exercise the back muscles and abdominal muscles. Included: 1 x Push Up Rack Board. Push Up Rack Board System Exercise Workout Push-up Stands Body Building Training GYM Tools. Product use: exercise the back muscles and abdominal muscles. 1 x Push Up Rack Board. Support plate size: 59.5 18 2cm. ActivityBodybuilding,Fitness,Gym & Training,Weight Lifting. BUILD UP MUSCLES -Push up bars are ideal for muscle training. SUPERIOR QUALITY & SLIP-RESISTANT -5Billion Push Up Bars are made of high quality polypropylene, which is sturdy and strong enough to support any weight. Fitness Technology. Rotating handles help reduce joint strain. Smooth-rotating handles accelerate results by engaging more muscles in the arms, chest, shoulders, and back, while reducing strain on wrists and elbows and stabilizing the shoulder joint. Handlebar Length: Approx. - S shape design and anti-slip feet will keep the push up stand in position stably. - Qualified handle foam on the handle and feet for anti-slipping and sweat absorbing and reducing friction during working out. 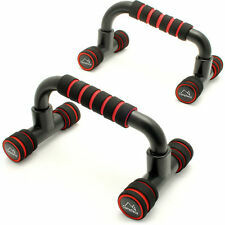 1 set of Push Up Bars(2pcs). Material: Carbon steel, sponge. Load Bearing: 150kg. Item type:Push Up Bar. Suitable for building upper body and core strength. Due to the different monitor and light effect, the actual color of the item might be slightly different from the color showed on the pictures. Description:1.Product Name: Collapsible Push-up Stand Exercise equipment2.Material: nylon TPR stainless steel3.Features:Foldable design, triangular support principle.Built-in stainless steel pipe, soft foam handle, ABS pipe plug, foldable interface, TPR anti-skid stand, high-strength nylon bracket.It can bear 300KG.4. Uses: exercise the upper limbs, exercise the chest muscles, exercise the abdominal muscles, exercise the back.5. Size(Approx. ): high 13CM/5.12in, length 16CM/6. The Adidas Push Up Bars a lightweight and feature a non-slip, comfortable design. Sold as a pair, the press up bars provide a sturdy platform and help ease wrist discomfort. Adidas Push Up Bars. Pair of Adidas Push Up Bars. This is a kind of fine quality household push up training board. Burn calories and build strength with this product, guiding you through a total-body strength and conditioning workout. You can have a try.